When it comes to fishing, spinning reels are the hot favorite to the anglers these days. This kind of fishing reels was introduced in the middle of 1948 by a French manufacturer. Featuring one spool (fixed) these reels are great and onto the spool, lines are deposited through one revolving guide which is called to be bail. Not only accommodating monofilament lines but nowadays it also goes perfectly with some newer lines made of fluorocarbon. Now let us go through the step by step process of how to spool a spinning reel! Get to know the way of your in which the reel bail usually turns. You have to hold the empty reel and in such a way that it would be oriented on the rod. Exactly as you do while retrieving, you have to turn your handle. Again you have noted the path of your bail’s turning. In this way, you need will be spooled directly onto your fishing reel. You have to note the opposite direction too. In this way, when you will be casting, your line would peel off the spool. The bait casting reels or the spin casting reels usually rests above the rode. But spinning reels are different. Generally, the spinning reels are constructed for hanging down from the fishing rod. You have to wrap your fingers of your hand with which you are going to cast around the mounting-bar. This is because you need to get a hold to that reel perfectly. While you will be reeling with one hand, you have to let your reel hang from the other hand. Now that you are done dealing with the reel with your hands, you have to note the way in which your line will wound on your filler spool. Here, you will try to orient your filler spool so that you can help the line to get peeled off in exactly the identical direction in which the reel bail usually turns when you turn the handle of your reel. To be clearer, the line should peel off in such a way that it can come off your filler spool in the identical direction in which it generally winds onto your reel. Now you are done doing your second step. In this third step, you have to gather the ends of the line to the reel spool and tie them up. You can use any of the knots between uni-knot and arbor-knot. There is a way of mounting the reel on your fishing rod. Do you want to mount them? If you want to then you get to opportunity to mount your reels. This is a great way of threading the line. You can easily mount the reel on the fishing rod and thread your line through the guides. You have to do it before you attach the reel to the rod. You are done with the preparation and now it is time to start you reeling process. You have to start to reel the line onto the reel spool. Try to turn your crank handle smoothly and at a slow pace with your cranking hand. If you want to add tension then you can do it and for it all you have to do it to pass the line in between the fingers of the casting hand. You can also add tension by raising the fishing rod slightly. The second method only works when if your fishing reel is mounted on your fishing rod. If it is mounted then you can also try both of the methods to gear up the tension. You have to always keep an eye on the line. After you have done cranking for a few times, you have to check your line for the twists. Are you taking up the fishing lines on the fishing reel spool in that identical way it usually pays off the filler spool? If you are then you should not have any twist. No matter what, you will still need to let the fishing line go slack so that it can check for twists. If any twist is seen there, you will see that the fishing line is starting to un-spool itself from the reel spool. Now your job is to peel off the line and flip your filler spool over. All you have to do now it starts again! You have to continue to fill the reel spool. The amount will within 3.2 mm or 1/8 inch of its rim. The fishing reel may have one mark or tab on the spool which will let you know if you have filled the proper amount or not. If you have not filled the proper amount then the casts will be shorter. It is because of the friction of your fishing line as it rubs against the reel spool’s top flange. If you filled the reel more than it need then your line will absorb additional water when it will get wet for slipping past the flange. It may cause you a backlash during your cast. Now you are done almost! Here, when you are finished, you have to cut your line off the filler spool. If you are not going to go fishing right away then you might feel the requirement of putting a rubber band around your reel spool so that you can keep the line in accurate place. How to spool braided line on a spinning reel? This is frequently asked is most of the fishing tips. Let us discuss that in a step by step formula. Firstly, you have to string the back through the eyes of your fishing rod and have to open the bail. Now, you have to wrap the line perfectly around reel spool twice for certifying that the knot is not slipping or spinning. You have to tie one uni-knot and trim the excessive line. Then you are required to pull the knot to the reel tightly. Now flip your bail shut and then start reeling the backing in. Keep tension on the line with the thumb and index fingers till the reel is filled half. Add up the line with the backing with the use of double knot and again trim the excessive line. Now start reeling and again try to keep the tension on the fishing line. What size spinning reel for bass should be chosen? Spinning reels are seen to vary from 1500 to 4000 when it comes to size. If you are preferring to fish in any lake where the lure is usually not heavy, go for the size 1500. When the lure is around 8-9 lbs. and you are a beginner, select the 2000-2500 size for bass fishing. If you are in an area where you have a text about 10 to 12 lbs. and you are a seasoned angler then your fishing reels may be of 2500-4000. How to put fishing line on a spinning reel? You have to string backing and have to open up the bail first. Wrap your line around the spool and then tie knot and trim line. Now you should flip the bail and start reeling. Put the tension on the line and go ahead! Where should spinning reel be surf casting? Surf casting reels usually have the long-cast spool technology included. These are made of cast in a vast place and fish there so that it can cover a large area. If any spinning reel and hold around 200-300 yards of the chosen line and has better detection of bite, less ballooning of life and less wind resistance when in beach then it can be considered as surf casting reel. A spinning reel basically works by the use of one fixed line spool along with a safeguard and a wheel which can go around its spool for taking up and discharging the fishing line. It usually enables a user casting the rod and the line at several distances so that it can cast smaller fish along with heavy bass. How to lube a spinning reel? To lube the spinning reel you have to remove the Spool Assembly and you have to do it by turning the drag knob by spinning it counter clockwise. You have to oil drive gear bearings, the line roller assembly, bail arm assembly, and maintenance port. In short, you have to boil everything in a reel that moves. Spinning reels are also known as the egg beaters or fixed spool reels. These are basically mounted below the fishing rod. The frequently asked questions about reels are related to baitcaster vs spinning reel. They have a different use in the own sectors. To hold the basics, when you are fishing with the light line go for spinning reels (approximately 8 lbs.) and when you are with any heavier line settle on the baitcaster, it’s simple! Fishing is an art and if the water is your canvas and spinning reels are your paints then you have to know the proper way to paint. How to cast a spinning reel? Yes! This piece of writing is a guide to that. Spooling your spinning reel appropriately will make sure that your line behaves perfectly on the reels and it will also aid you in casting easily. Great article! I like this step by step guideline on how to spool spinning reel. Wow! 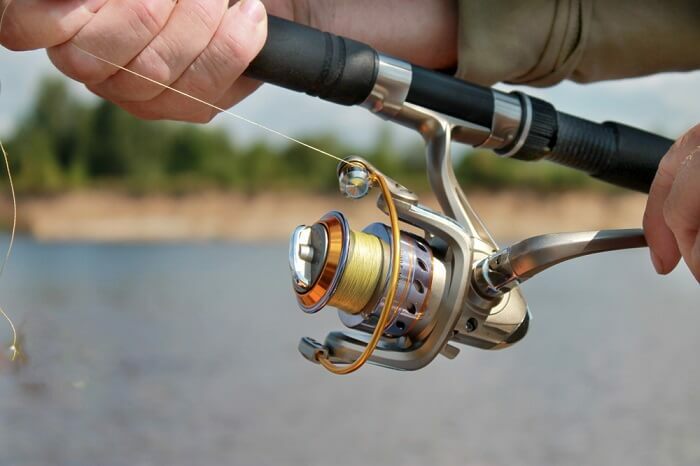 Such an awesome post.This is a great article thanks for sharing this informative information.I appreciate to step by how to spool a spinning reel..you are easily describe this topic..